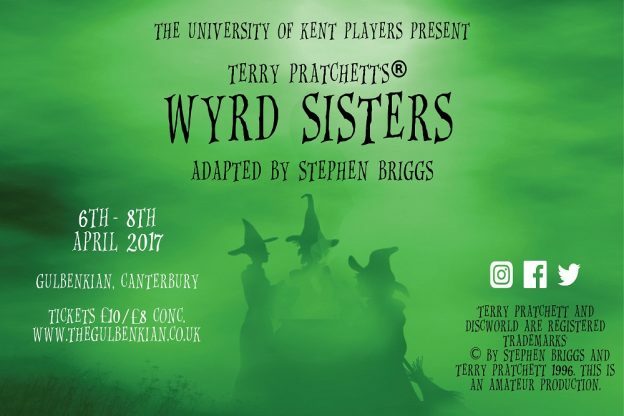 Adapted for the stage by Stephen Briggs, the University of Kent Players are proud to present Terry Pratchett’s Wyrd Sisters this April. The University of Kent Players were founded in 2013 by Neil Hornsey and are made up of staff at Kent who love the theatre. Follow witches Granny Weatherwax, Nanny Ogg and Magrat Garlick in Terry Pratchett’s Wyrd Sisters as they attempt to stop the destruction of their kingdom from the wicked Duke and Duchess. Expect ghosts, spells and a whole lot of fun as Pratchett’s reworking of Shakespeare’s Macbeth is brought to life. Buy tickets from the Gulbenkian box office or online today! This production will be raising money for The Orangutan Foundation and is directed by Vicky Gatward-Warner and Sophie Taylor-Gammon. This entry was posted in Campus online, Medway Student, Student Guide on 31 March 2017 by George Williams.